The Volquartsen Target Hammer is designed to give the stock Ruger 10/22 a superb "trigger job" by simply installing this hammer. No stoning or fitting is required to sear or springs. Volquartsen's target hammer may appear similar to the production hammer but is geometrically advanced in the sear engagement area. It is sapphire honed for superior hardness and lubricity. Trigger pull is reduced to 1.75 - 2.50 lb. depending on the age of the gun and how much it has been fired. Hammer also comes with the bushings to allow it to be used in the newer 10/22s. I have had my 10/22 for 25 years, put tens of thousands of rounds through it and always have been annoyed by the trigger pull. After doing my folding stock, scope, bi-pod the only "mod" I have done is the target hammer. I am VERY happy with the feel. It pulls so much easier and clean. From what I have researched there are other more technical (and expensive) trigger jobs for match shooting and such, but for a quick and effective remedy to the stiff 10/22 trigger this little unit is worth the money. The unit I received had the shims, two springs AND the bushings (not pictured). Volquartsen has done it again! If you have a 10/22, you MUST have this! It should be advertised as "Trigger Job in a Bag". Installation was easy. Trigger pull is lighter, and MUCH smoother. Get yours today. This is my second Volquartsen target hammer from Rimfire Sports&Custom, it lowered my trigger pull from 5 3/4 to 2 1/2 pounds and is very smooth. Shipping was very fast and the installation is simple. I would highly recommend this upgrade. Incroyable !! Pour le prix il y a pas mieux, aussi sensible qu'avec un kit titane complet Power custom. A acheter en priorit�. Very nice upgrade, at a very good price. Parts very high quility. 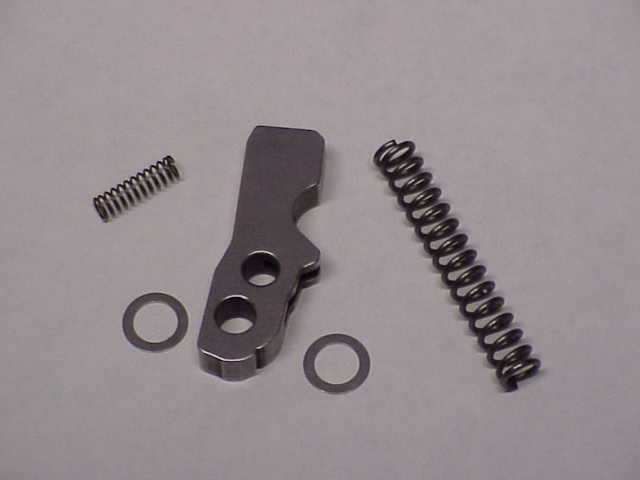 In this kit only use the hammer and shims, your factory springs are stronger and it will save you from taking out the trigger and sear. If you need any help installing this part go to 10/22 help web site they will show and tell you step by step how to do it! Made trigger pull light and crisp, JUST INSTALL HAMMER AND SHIMS. LOVE IT!!! lowered my trigger pull to 1.8 lbs!!! !